In Level 2 you will learn how to use 3 symbols, Cho-Ku-Rei the power symbol, Sei-He-Ki the Mental-Emotional symbol, and Hon-Sha-Ze-Sho-Nen for distant healing and attunements means no past no present no future. Can be drawn clockwise or counterclockwise. Cho-Ku-Rei will increase the power of Reiki. It is used at the beginning of every session. Cho-Ku-Rei has several translations some are Direct Spirit or Let the power be here. Cho-Ku-Rei is sometimes called the light switch. It can be used anytime while giving a healing. In the beginning of the healing session to increase the power flow. At the end of the healing session to seal the treatment. Cho-Ku-Rei can be used to clear a room of negative energy and to seal it in light making it a sacred place. Cho-Ku-Rei can also be used for protection use it to protect yourself, your car your children, your home anything that you feel needs to be protected. Cho-Ku-Rei provides protection on all levels including physical harm, verbal, and emotional confrontations, and also from psychic attack. Sei-He-Ki is the symbol use for mental and emotional healing. It provides purification and cleansing. Sei-He-Ki mean purification by the fire of wisdom. Sei-He-Ki Balances the right and left sides of the brain. It is very good for healing relationship problems and can be used with any mental and emotional distress such as nervousness, fear, depression, anger and sadness. Sei-He-Ki can be used to treat addictions, problems with weight loss and smoking. Sei-He-Ki can help improve memory. On a piece of paper write your name, unwanted habit and the Sei-He-Ki symbol then hold the paper between your hands treating it with Reiki. This will send Reiki to the parts of your mind that relate to unwanted habits and you will begin to heal. Do this for 20 minutes each day. Carry the paper with you if you feel the compulsion during the day; take out the paper and Reiki it. Using this method you will find it easier to get rid of that unwanted habit. 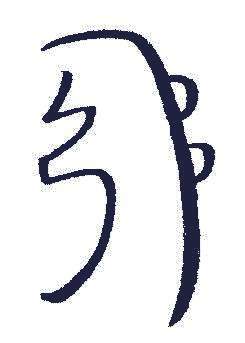 Hon-Sha-Ze-Sho-Nen is the Distant Healing symbol. Hon-Sha-Ze-Sho-Nen means No past, no present, no future. Freedom from delusion, limitation and Karma. It can be used in every healing session for past and future aspects of the situation being healed. Hon-Sha-Ze-Sho-Nen is used to send Reiki to others at a distance. You can send healing and Attunements (Master Level) across the room or across the world. With Hon-Sha-Ze-Sho-Nen you can send to any place in the world or any time zone. It is a good idea to use a picture when sending to a distance to help you center in on the person that you are sending to. Establish a connection using Hon-Sha-Ze-Sho-Nen and the persons Picture (best) or Name and description. Hon-Sha-Ze-Sho-Nen helps you understand that time is just an illusion. You can time your healings or attunements by stating the time you intend the healing/attunement to be received. When sending in time, make sure to specify exactly when the person should receive the energy. I use this when I give most attunements and it works great be sure you are very specific. I intend to send healing to Joan Doe on January 23, 2002 at 3:00 p.m. central time (or "her time "works well). Be careful with using this method or you could send to the incorrect day or time or even year. Distant healing can be sent by a group of Reiki 2 and Master practitioners with powerful results. To start everyone in the group draws the Hon-Sha-Ze-Sho-Nen symbol then chants its name 3 times and chants the name of the person to receive healing 3 times. Then everyone in the group sends healing. Here are two ways to sit in the group. 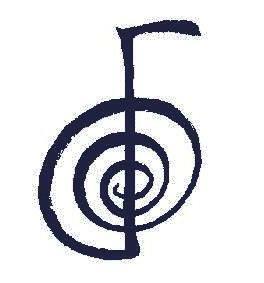 Spiral (clockwise spiral) each person sits facing the back of the person in front of them and sends Reiki to them with their hands a few inches from the person's back. The outer end person sends the group Reiki to the person in need. 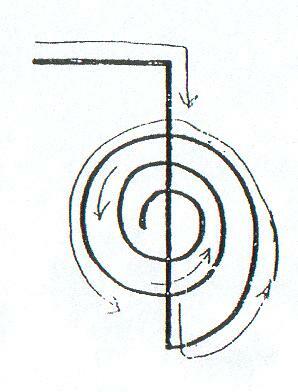 The circle method is similar to the spiral method except the person who is to receive the healing is imagined to be in the center of the circle. Everyone in the group sends to the center of the circle. The attunement opens charkas so that Reiki can flow. The attunements also increase intuition and sensitivity to psychic energy. Using the charkas in the palms of your hands, it is possible to sense where Reiki is needed. With your left hand 1 to 4 inches over the body, start at the head and slowly move down the body. Be aware of how the energy on the palm of your hand feels. If you feel a distortion in the energy field, your have found a place that needs Reiki. You may also feel this as tingling, pressure, and little electric shocks. Your hand maybe guided to the correct spot. As you practice your ability to scan the aura will improve. When you find a distortion. Bring both hands together at this spot and let the Reiki flow there. Reiki will heal the distortion in the aura and work on the areas in the physical body connected to it. As you interact with the client's energy fields you will become connected to them. You may also be given insight into how the problems were created. If you are an empath you may feel their pain, be sure you disconnect after the healing or you could keep having their pain. you may see colors like dark red for anger, yellow-green for infection etc. Some people will see what happed to the client (in their mind it will be just like watching a movie). If you are one of those people train you can train your self-not to do that. The memories that you see become like you own. It is ok to feel the clients pain it shows you where to send Reiki to, follow your guides. You can also self- scan. You can use the Hon-Sha-Ze-Sho-Nen symbol to beam Reiki across the room or across the world. Beaming is used in distance healing also. Some ways to do distance healing is imagine the person if front of you and do the session like they were really there. I use a stuffed animal as a stand in, for the person I am sending the healing or attunement to. You can also use the Hon-Sha-Ze-Sho-Nen symbol to send healing and attunements to the past or present. Focus your mind only on Reiki by doing this you will enter a state that allows the Reiki to flow more easily. The above is from Diane Stein's Essential Reiki If you don't have this book yet. I would recommend this it is great. Dr. Mikao Usui rediscovered Reiki in the late 1800's.. He was the director of a Christian school in Japan. Ask by a student if he believed the Bible to be literally true, did he believe that Jesus really healed the sick. Dr. Usui said, he believed that the Bible as literally true and yes Jesus did perform miracles. Dr Usui traveled to the United States and entered the Chicago School of Divinity, where he earned his Doctorate in Theology. However, he did not find the answer to his question, How may you heal the body? He returned to Japan and entered a Zen monastery. There he studied ancient Buddhist, Sanskrit, and Tibetan texts. He found the formula for healing the body in the ancient texts, but he did not have the ability or understanding to use it. So he decided to Fast and Meditate. He traveled to the holy mountain of Kuriyama. He climbed the mountain chose the spot for his meditation then gathered 21 stones and piled them before him. Each day he threw one stone down the mountain. On the final morning, just before dawn. Dr. Usui saw a beam of white light coming toward him. His first reaction was to run. However he decided to stay still. The light entered his third eye and he lost consciousness. He reported that he saw millions of rainbow bubbles and little known Sanskrit symbols glowing in gold. . As he saw each of the symbols he was given the names and uses for each as well as information on how to activate the healing energy. DR. Usui cam down the mountain and experienced what is know as the miracles. 1. Coming down from the mountain he stubbed his toe on a rock and fell to the ground. His toe was bleeding he instinctively grabbed his toe after a few minutes, the bleeding stopped and the pain disappeared. 2. Dr. Usui had fasted for 21 days and then ate a very large breakfast without any adverse effects. 3. The innkeepers granddaughter had a bad toothache for several days. Dr. Usui laid his hands on her face and she immediately felt better. Before his death, Dr Usui passed the teaching of Reiki to his closest associate Dr. Chijiro Hayashi. Dr. Hayashi opened a clinic in Tokyo where he practiced Reiki. Here Ms. Takata came for healing Hawayo Takata was Hawaiian of Japanese decent. She was in Japan facing surgery for gallbladder disease appendicitis and a tumor. On the operating table she heard a voice telling her &quot;The surgery is not necessary&quot;. She got up off the table and asked the surgeon if there was another way for her to heal. He directed her to Dr. Hayashi's clinic. She was completely healed in four months. She decided she would like to be trained in Reiki so she stayed in Japan and became a student of DR. Hayashi. Dr Hayashi knew a great war was coming and decided to pass the complete teaching to two women. His wife and Hawayo Takata. When you are attuned to Reiki you are opened to the universal life energy. Reiki attunements are much like tuning in you TV station. The TV waves are there you just need to tune them in. The same is true with Reiki. Reiki does not only treat where your hands are placed but will travel to where it is needed in the body. Intuition is important when using Reiki. Move your hands to where you are guided even if that is not where the pain is. Reiki neutralizes anesthesia quickly do not use before surgery or dental work. Do not use on broken bone until a Doctor has set them. Do not use on a severed limb until it has been re-attached. The energy can seal off veins and nerves making it hard to re-attach the limb. In these cases if is ok to treat other parts of the body such as the adrenals for shock. If you are Diabetic Reiki can reduce the amount of insulin you need have your Doctor monitor you dosage. Reiki your food, plants, and garden seeds. Your pets, Reiki will also heal animals. Gifts that you give. Stuffed animals, baby blankets, etc. Reiki your money for increased flow. Your car to make it run better or your kid's car to make it safer. Reiki will quickly dissipate the effects of alcohol. Reiki the adrenals when people are in shock. Been stings, bug bites, burns cuts, sprains and bruises. Reiki someone who is dying to aid in a more conscious departure. Reiki heals the planet and you every time you use it. You can clear the room of negative energy. I use my hand as a knife to disconnect I start at the top of my head then slice down to my toes. You can also just pull your mind back. The body has a North and South. The head is North and the feet are South. Your right hand is North and your left hand is South. Your right hand should always be North of the left hand. This will keep you and your client for nasty side affects. Get the room ready by drawing the Cho-Ku-Rei in the middle of the room. Visualize the room filling with white light, ask your guides to support you during the healing session. Bring client into the room. Find out why he/she has come for treatment. Show the client where to sit or lie down (a massage table is great for this). Have the client relax soft music is nice for this and also incense or candles. Allow client to remain still for a few minutes. If he is dizzy you can put your right hand on his forehead (3rd eye charka) and your left hand on his solar plexus. Be sure to disconnect from the client. Make sure your client is fully present before they leave. Do not let weak or dizzy clients leave. Walking around will also help to ground them. If you have time you can also let them sleep for a while. Not everybody gets side affects but they can last up to 21 days and can be anything from feeling like you have the flu to depression. The attunement can make you want to sleep or it can make you hyper. No two attunements are the same even with the same master and person receiving the attunement. Do what you guides tell you to I give free Reiki and I also charge for it. How you find me is up to your guides lol.